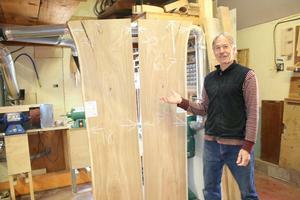 Geoffrey Warner talks about the beauty of two matching pieces of elm that he will turn into a dining room table. When the economy crashed about a decade ago, Geoffrey Warner and other island artists and creators got together for a series of vision meetings with one goal in mind: to inspire each other to be even better, and to work together to get out of the trenches. 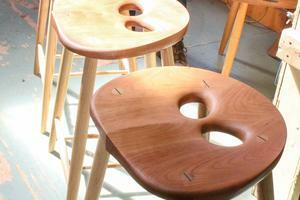 Warner said he felt inspired from those meetings, and from that inspiration the first Owl Stool was created in 2009. Fast forward a decade, and the stool, and Warner’s Owl Furniture company, are celebrating 10 years of business this year. The design Warner landed on was common in shape, but the difference was two holes carved into the wooden seats. “The holes allow a person to better sit in the stool, which makes it not only more comfortable but better for the person’s overall back health,” he said. “That’s my philosophy, and it’s really the philosophy we have developed with Owl Furniture, that as human beings, we are constantly moving from a fulcrum point. Nobody moves at square, right angles. When our work spaces and the things we sit on allow us to have continual round motion, it is healthier ergonomically. That is exactly what we are trying to accomplish,” he said. With ergonomics as a backbone and a round center of motion as a selling point, Warner, along with Belinda Hunter, who handles the marketing and business side of the company, hit between 15-18 furniture shows a year along the eastern seaboard, educating potential customers on the benefits of their creations. “We are very happy to be able to do the business we do from all the way here in Stonington,” he said. Now 10 years in, Warner has no intention of slowing down. He is looking into grant funding to create his stools from not just wood but recycled polymers, in order to be able to produce more volume. It is his intention to use recycled fishing line and netting, in order to help clean up the oceans. Furniture design has been Warner’s life since his days studying at the Rhode Island School of Design. The Owl Stools, and the products that have stemmed from them, have allowed the self proclaimed free thinker to make a living doing what he loves most. 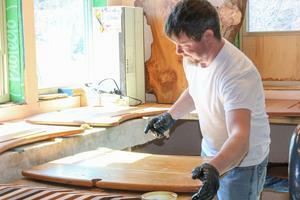 Allen Hagerthy puts a coat of finish on what will become an adjustable desk. Owl Stools are Geoffrey’s Warner’s best seller at Owl Furniture.